Bonito y moderno apartamento en Estepona compuesto por 2 dormitorios dobles uno de ellos con baño privado, salón-comedor, 2 baños y una terraza con impresionantes vistas al jardín de la urbanización y a la piscina. El apartamento es moderno y espacioso, totalmente diseñado para su comfort, con todo tipo de artículos de primera necesidad incluyendo una cocina totalmente equipada (lavadora, horno, lavavajillas, vitroceramica, tostadora, tetera, cafetera.....). También dispone de aire acondicionado, WiFi y Sky TV. La terraza es una maravilla, podrá encontrar sofás y hamacas, ideal para relajarse, y desde la cual podrá ver el magnífico atardecer. El complejo tiene 2 piscinas muy grandes con una cascada incluida, gimnasio, sauna y baños para cambiarse, ideal para relajarse después de un magnifico día de sol, playa y golf. La urbanización es privada con seguridad 24 horas y parking privado. Apartamento Ideal para familias. Desearás volver!! Excelent all around experience!! We will come back for sure!!! The apartment is exactly as described, really clean and very pleasant and beautiful decoration. Excellent taste all-around. The building compound has superb outdoor common areas and services; just perfect to relax and spend time with the family, while enjoying the beautiful gardens and amazing views. 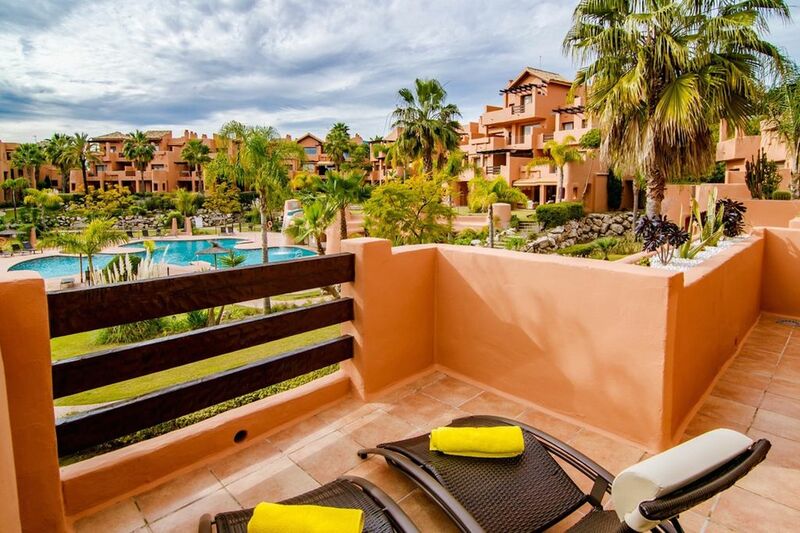 The apartment is just 8 minutes from Puerto Banus, Laguna Village and Estepona. We also did a road trip to Granada, Jerez de la Frontera and Sevilla. All of them located within 2 hours maximum driving time. Jorge, the owner, is a really nice host. From the beginning and throughout the booking, he was really fast responding to our requests and very helpful and supportive on every occasion we needed him. Dear yaneth, thanks for your review, I will be waiting for you to come back!!! Das Apartment war so wie auf den Fotos, alles sauber und sehr modern. Der Vermieter war sehr nett und sehr hilfsbereit. Die Anlage ist traumhaft schön mit blick auf den Pool. Ich kann es nur weiter empfehlen. Für Familien und Paaren geeignet. Wir waren als vier köpfige Familie unterwegs und wir werden sicher wieder kommen. Jorge Herrera ist ein sehr guter Gastgeber. Jorge Saludos aus der Schweiz!!! The apartment was just like the photos, all clean and very modern. The landlord was very nice and very helpful. The complex is beautiful with a view of the pool. I can only recommend it to others. Suitable for families and couples. We were on the road as a family of four and we will surely come back. Jorge Herrera is a very good host. Juan Jose, thanks for your review!! Hope to see you soon!!! Jorge is a great host and the apartment provided everything we needed whilst on holiday. The rooms were spacious and the complex is secure. I would definitely recommend this setting for a relaxing holiday. Thanks for you words!! Hope to see you soon!! Wij hebben een heerlijke week gehad in Estepona. Het appartementen complex was mooi groen, netjes onderhouden en met een fijn zwembad. Ook de parkeergarage was een groot voordeel met de warmte. Het appartement zelf was erg schoon en alles was aanwezig. De verhuurder reageert heel snel op je berichten en is daar ook goed bereikbaar. Wij raden het zeker anderen aan. Beautifully furnished, spotlessly clean, Great terrace, very peaceful, spectacular view straight to the pool area. The grounds, swimming pool are perfectly looked after. The gardeners were out each morning attending to the grounds/gardens. A car was definitely needed as nothing much in walking distance and no buses to what I saw. Great little English run pub (Rita's) within 2-5 minutes walk. Only 10 minutes drive into Estepona. The booking process was very smooth and Jorge (The owner) was very quick to respond to any queries, and very helpful in arranging our check in with Lynn who was there to greet us on our arrival and told us all about the apartment and the surrounding areas including telling us about a great little English run pub (Rita's) within 2-5 minutes walk. The apartment is exactly as described, spotlessly clean, comfortable and with every amenity you could wish for. The outdoor areas are, as illustrated, quite superb, and we were lucky enough for the complex to be very quiet so we had the lovely communal pool completely to ourselves a few times during our 10 days stay. Thanks for your kindness, hope to see you again soon.